Buzzkills will argue that Javier Vazquez's win last night should appear in this morning's box score with an asterisk because it came against the Orioles, a team currently 22 games (!) under .500. (Flat-out pessimists will argue that his last win should get one, too, since it was against a National League club.) But his early season starts were so ugly — and so frustratingly inefficient — that he'd have been roughed up no matter the opponent. Things are a little different now. Last night's outing — in which he threw seven innings of one-run ball for his first win in a home start this season — makes three good starts (and one awful one) in his last four. 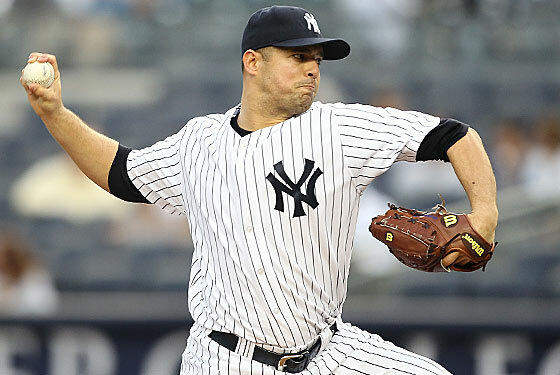 The Yankees can survive with an inconsistent Vazquez; they just can't survive with automatic-loss Vazquez. We do hope we've seen the last of automatic-loss Vazquez. Of course, even with Vazquez's effort, last night's game might have turned out differently if Baltimore didn't continue to find new and creative ways to lose. For a change, their bullpen actually did its job, with David Hernandez getting Alex Rodriguez to ground to third with two outs and two men on in the seventh. But Miguel Tejada's throwing error allowed both runners to score, losing the game by a 3–1 score for poor Brian Matusz, who's now 0–3 against the Yankees this year despite a terrific 2.41 ERA in those games.